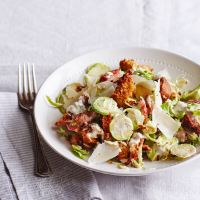 A food processor with a ne-slicing blade makes quick work of the sprouts in this wintry twist on a summer favourite. 1. Preheat the oven to 200°C, gas mark 6. Toss the bread with the oil, season and bake for 10-15 minutes, until crisp and golden; set aside. Meanwhile, put the sliced sprouts in a large bowl, season and toss with 2 tbsp lemon juice. 2. Put the lardons into a cold frying pan, then turn up the heat until the fat starts to melt. Cook for 5 minutes, add the garlic, then cook for 5 minutes more, until the lardons are golden and the garlic is soft. Use a slotted spoon to scoop the lardons and garlic into the bowl with the sliced sprouts. a moment. Crush the garlic in the pan, whisk in the remaining 1 tbsp lemon juice and the vinegar, then stir in the yogurt, mayonnaise, worcestershire sauce and parmesan; season. 4. Add most of the croutons and dressing to the sprouts and lardons; toss to coat. Put the salad on a platter and top with the rest of the croutons, dressing and shaved parmesan.